This property was built before 1821. It is included with the 1843 Tithe Apportionment entry for Thomas Brett as House Garden and Smithey. It is shown with the Blacksmith’s forge in the rear garden on the Tithe map of 1843 as a single unit. The forge became legally separated and although the last blacksmith, Henry Harvey, worked there until he died in 1941, the freehold was not owned by him. The forge and its building has not survived, being replaced by car parking, but Devonport House is still present and must look much as it has always done. Devonport house could be named after the Naval base, Devonport, near Plymouth. This port was constructed as a safe haven up the river Tamar in Sir Frances Drake’s time but the place name of Devonport may have been coined around 1823, but that gives us a problem. 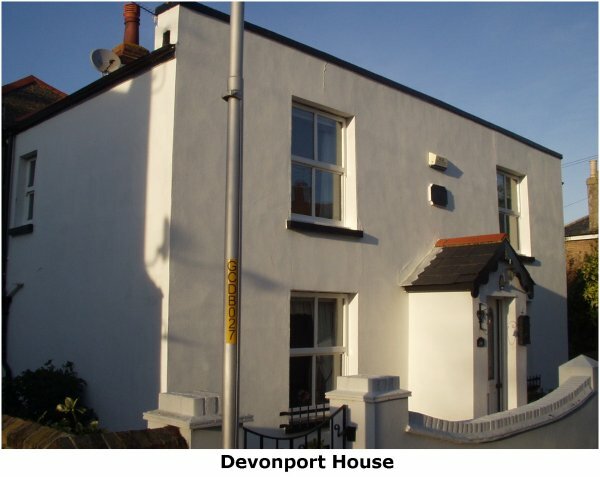 The house was definitely occupied by the blacksmith before 1823 but the house needs a connection to Devon to be so named – the naming must have been much earlier. Deal’s strong Naval connections have seen several people from the Plymouth area working from here, which may have led to this property being so named. The property itself may date from a much earlier period. It is architecturally in the style of the Queen Anne period – around 1715 – but there are no visible bricks making it difficult to check. It is interesting to note that two families and a boarder were living there together in 1911, a total of 7 people. The Cook family are related to Henry Harvey’s wife. See the related page on Upper Deal blacksmiths.